I am wearing the costume. I came up with the costume when I went to comic con and I saw all these cool costumes around me and I thought "I wanna do something like that"; and also watched Mad Max Fury Road and I enjoyed it and I really liked the War Boys in the film. What I did for the costume was I put on and applied on a bald cap on my head, I then put on white face powder on my face. 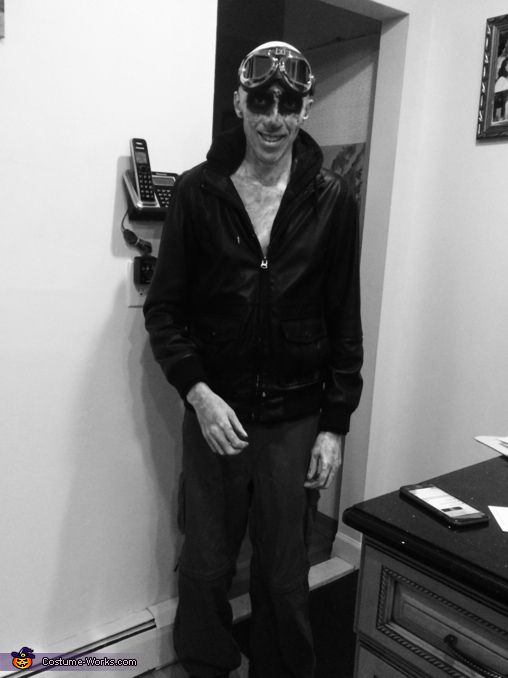 I put on white and black face and body paint on both my face and body; after that I put on a pair of black cargo pants, boots, a leather jacket, and WWII Raf Vintage Pilot Motorcycle Biker Cruiser Goggles. I finally used a duct taped can of chef master edible silver spray for my mouth and as part of the costume. I had gotten a lot of compliments on the costume and a lot of random people had wanted to take pictures with me, a lot of people thought the costume was awesome and also thought it was both creepy and scary. A lot of random people had also screamed "Witness me!" when the saw my costume.